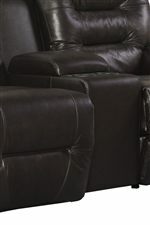 Complete your entertainment area with the wonderful comfort and convenience this console loveseat has to offer. Generous padding is one of the many highlights in the piece, seen in the plush pillow arms and fully padded chaise, bringing you comfort and support for your whole body. The channel-tufted back exudes classic, casual comfort, while the center console provides modern convenience. The console offers storage space perfect for storing your remote or snacks for a movie marathon, complete with two cup holders to give you everything you need right at your fingertips. Comfortable and convenient, with smart functions and supportive padding, this console loveseat is the missing puzzle piece to your perfect entertainment room. 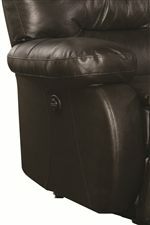 Available in space saver, rocker, power space saver, and power rocker recliner options. 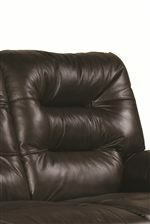 The Maddox Power Rocker Console Loveseat with Pillow Arms by Best Home Furnishings at Best Home Furnishings in the St. Louis, Chesterfield, St. Charles, MO & Waterloo, Belleville, Edwardsville, IL area. Product availability may vary. Contact us for the most current availability on this product.